Matured Hop-Derived Bitter Components in Beer Improve Hippocampus-Dependent Memory Through Activation of the Vagus Nerve, by Tatsuhiro Ayabe, Rena Ohya, Yoshimasa Taniguchi, Kazutoshi Shindo, Keiji Kondo & Yasuhisa Ano . Scientific Reports, 2018; 8: 15372. Background: Our group has focused on the constituents of beer, and we found that iso-α-acids, major bitter components in beer derived from hops (Humulus lupulus L.), improve cognitive impairment in an Alzheimer’s disease (AD) mouse model and high fat diet-induced obese mice. Conclusion: Vagus nerve activation by the intake of food materials including MHBA [matured hop bitter acids] may be a safe and effective approach for improving cognitive function. Competing Interests: T.A., R.O., Y.T., K.K. and Y.A. are employed by Kirin Co., Ltd. The authors declare no other competing interests with this manuscript. [Thanks to Eric Bardot and Maggie Tauranac for sending this excellent example}. In FoodNavigator, I read a report of a study finding that processing of corn into breakfast cereal flakes strips out phenolic compounds and tocopherols (vitamin E) associated with good health. Just as processing of whole wheat into white flour removes the bran and germ, so does the processing of corn into corn flakes. The germ and bran (hull) layers of grain seeds contain the vitamins and minerals—and the phenolics. What’s left is the starch and protein (endosperm). To replace these losses, manufacturers fortify corn flakes with 10% to 25% of the Daily Value for 12 vitamins and minerals. This study is further evidence for the benefits of consuming relatively unprocessed foods. This work was funded in part through gifts from the Kellogg Company and Dow AgroSciences. This makes this study a highly unusual example of an industry-funded study with a result unfavorable to the sponsor’s interests. The authors do not perceive Kellogg funding as a competing interest. It is. Kellogg (and maybe Dow) had a vested interest in the outcome of this study. I would love to know whether these authors obtain further research grants from Kellogg and Dow. Coming October 30: My new book about food company sponsorship of nutrition research and its effects on public health. To introduce the book, which describes the consequences of conflicts of interest generated by food industry research funding, I will be doing a series of posts about it over the next few weeks. I begin this series with a discussion of how I manage my own financial relationships with food, beverage, or supplement companies. As a nutrition professor, even one who is retired, I cannot avoid contacts with food companies, nor do I necessarily want to. I need to know what they are doing. I go to meetings sponsored by food companies, read journals sponsored by food companies, read newsletters they send me, and get frequent gifts of books, research materials, product samples, and swag ranging from small (jump drives, squeeze toys) to enormous (would you believe a room-size punching bag that looks like a cola can?). I give talks to and occasionally consult for food companies. At issue is how to do this without being influenced to change what I write or say—or appear to be so influenced. If I were wealthier, I would just pay my own expenses and be done with it. As it is, I figured out a management policy for dealing with food company gifts and payments. I accept reimbursements for travel, hotels, meals, and meeting registrations (otherwise I would not be able to go). I do not accept honoraria, consulting fees, or any other personal payment. Instead, I ask the company to make an equivalent donation to the NYU Library’s Food Studies collection (which is named after me) or to my department’s fund for student travel. If the checks come to me directly, I endorse them over to NYU. I report all such income appropriately on tax forms. I am well aware that this policy is not perfect. Small gifts, meals, and travel reimbursements are thoroughly established to influence physicians’ prescription practices, and I derive reputational benefit from donations to NYU. But this policy makes me think carefully about conflicted situations and I try to make it work as well as I can. Marion Nestle’s retirement and research funds from New York University support her research, manuscript preparation, and website at foodpolitics.com. She earns royalties from books, and honoraria and travel from lectures, about matters relevant to this publication. A summary of this policy is posted on the About page on this site. My email inbox was flooded last week with The Obesity Society’s call for more research on the value of taxes on sugar-sweetened beverages. “Although taxing SSBs might generate revenue that can be used to promote other healthy food items, the net outcome may not necessarily decrease overweight and obesity rates in the United States or worldwide,” said Steven B. Heymsfield, MD, FTOS, President-Elect of The Obesity Society (TOS) and professor and director of the Body Composition-Metabolism Laboratory at the Pennington Biomedical Research Center at Louisiana State University in Baton Rouge. Why would a professional society that represents people who ostensibly care about obesity science, treatment, and prevention issue a statement aimed at casting doubt on a demonstrably effective public health measure? (Soda companies know the taxes are effective; that’s why they fight them so hard). The Obesity Society (TOS), alas, often appears far more favorable to the interests of food and beverage companies than those of public health. Could funding of the society and its members have anything to do with this? TOS recognizes the value in providing any donor that wishes to support our mission to find solutions to the obesity epidemic the opportunity to provide financial support. The current TOS policy expressly eliminates all forms of evaluation or judgment of the funding source (other than the stipulation that funding is reasonably assumed not to be derived from activities deemed ‘illegal’). TOS chooses instead to focus its ethical mission on transparency in disclosing the sources of funding, clear stipulations outlining our commitment to the ethical use of funds, and a commitment to non-influence of the funding sources over the scientific aspects of funded projects and TOS as a whole. Translation: We will take money from any company, regardless of the effects of its products on public health. The TOS rationale is that disclosure takes care of the problem and that funding won’t influence the science. Unfortunately for this view, research demonstrates that disclosure does not eliminate the influence of funding, and the influence of funding is considerable—though often unrecognized, as is apparent in this case. TOS has a disclosure policy, and discloses its officers’ conflicts of interest. These are considerable. The TOS president’s university, Louisiana State, has received more funding from Coca-Cola than any other in recent years. Researchers there have been funded generously by Coca-Cola. An elected president of TOS had to resign over charges that he had been paid by the restaurant industry to file an affidavit opposing New York City’s calorie-labeling proposal. TOS members who care about creating a healthier food environment should consider joining Dr. Freedhoff. lf not, they should insist that TOS leadership take vigorous pro-public health stances on matters affecting their patients’ health. Marion Nestle, on the other hand, is professor “emeritus” and our understanding is that she no longer reports directly to a dean at New York University. That created a hurdle for us when trying to manage Dr. Nestle’se false and misleading blog related to this matter on her website. Even after learning her comments were misleading from Dr. Popkin, and unlike Popkin who has a high ethical standard, she failed to take down that post. This surprised me, because nobody from TOS or anywhere else had written me to correct the post, Dr. Popkin’s corrections were to something he—not I—had written, and my ongoing relationship with NYU is readily evident from the information posted under About on this site. I pointed this out to Dr. Heymsfield, who replied with annotations to my post. Most of these deal with opinion and interpretation rather than fact. The one thing I got “completely false” is my interpretation that TOS lacks standards for deciding which donors are acceptable. Dr. Heymsfield says it does. I am happy to hear that and stand corrected on that point. Last week, New York Times reporter Roni Rabin wrote how the National Institutes of Health (NIH) solicited funding from alcohol companies to fund—and, distressingly, participate in the design of—a study of the effects of moderate drinking on heart disease risk. This is not the first time Ms. Rabin has written about this study. In July, she described the study and its funding. Since then, she has apparently been busy filing FOIA requests and conducting further interviews. These reveal that the NIH actively solicited industry funding and input into this trial. The [NIH] presentations gave the alcohol industry an opportunity to preview the trial design and vet the investigators. Indeed, the scientist leading the meetings was eventually chosen to head the huge clinical trial. They also made the industry privy to pertinent details, including a list of clinical sites and investigators who were “already on board,” the size and length of the trial, approximate number of participants, and the fact that they could choose any beverage. By design, no form of alcohol — wine, liquor or beer — would be called out as better than another in the trial. On January 16, 2015, I was called into the office of the Director of NIAAA and was essentially reprimanded for conducting NIAAA-funded research that was detrimental to the alcohol industry…At the meeting, I was told that I would never again be funded to conduct research on alcohol marketing, regardless of how highly my research proposal was scored by the scientific review panel. Let me be clear: research ethics require funders to have no involvement in research design, conduct, or interpretation, lest they exert undue influence on the results. The NIH is now investigating whether the researchers violated federal policy by soliciting donations, and they’re appointing outside experts to review the design of the study. We don’t yet know the full story, and there’s surely more to uncover. Anheuser Busch InBev, Heineken, Diageo, Pernod Ricard, and Carlsberg helped pay $67.7 million of the $100 million government study, which is currently underway. And even more troubling is that if you were a patient looking to enroll in the trial through the online clinical trials registry, you’d have no way of knowing about the industry’s involvement because that funding is not disclosed there. Although I do not have much to say about the alcohol industry in my forthcoming book, Unsavory Truth: How Food Companies Skew the Science of What We Eat, I mention of this study as an example of how other industries skew research and also how pooling industry research funds is insufficient protection against conflicted interests (alcohol companies agreed to contribute 67.7% of the funding). It’s good that the NIH has decided to investigate this dubious government-industry partnership, which so clearly seems aimed at marketing, not public health. I haven’t posted an industry-funded study with predictable results in a while but when I saw this headline from FoodNavigator-Asia, I couldn’t resist. High marks to FoodNavigator-Asia for naming the funder in the headline. Breakfast consumption among Malaysian primary and secondary school children and relationship with body weight status – Findings from the MyBreakfast Study, by E Siong Tee, Abdul Razak Nurliyana, A Karim Norimah, Hamid Jan B Jan Mohamed , Sue Yee Tan, Mahenderan Appukutty, Sinead Hopkins, Frank Thielecke, Moi Kim Ong, Celia Ning, Mohd Taib Mohd Nasir. Asia Pacific Journal of Clinical Nutrition 2018;27(2):421 – 432. Purpose: To determine the relationship between breakfast consumption and body weight status among primary and secondary school children in Malaysia among 5,332 primary school children aged 6 to 12 years and 3,000 secondary school children aged 13 to 17 years. Cereal Partners Worldwide is a joint venture between Nestlé and General Mills. They have an interest in promoting breakfast cereals. Nevertheless, the authors who work for CPW or Nestlé believe that their employment with companies with vested interests in the outcome of research creates no conflict of interest. Breakfast, as Julia Belluz of Vox puts it, is often dessert in disguise. This particular study was performed by some of the same investigators discussed in the New York Times as part of its Planet Fat series. See: Fuller T, O’Connor A, Richtel M. In Asia’s fattest country, nutritionists take money from food giants. NY Times, Dec 23, 2017. No, I do not believe that breakfast is the most important meal of the day (I’m not much of a breakfast eater). Eat when you feel hungry. It does make sense to think that children should be fed at regular intervals and should not go to school hungry. It also makes sense that regular meals encourage healthier patterns. But preventing obesity? That seems like a stretch, especially when the study’s funders have a financial interest in selling breakfast cereals. Splenda is safe. Guess who funded the study. For months now, I haven’t posted an industry-funded studies with results favorable to the sponsor, but this one about deserves mention. Title: Critical review of the current literature on the safety of sucralose, by BA Magnuson, A Roberts, and ER Nestmann. Journal: Food and Chemical Toxicology 2017:106:324-355. Conclusion: “Collectively, critical review of the extensive database of research demonstrates that sucralose is safe for its intended use as a non-caloric sugar alternative. Financial support was provided by the Calorie Control Council, Atlanta GA, to the employers of the authors for the preparation and publication of this review. It paid authors affiliated with Health Science Consultants, Inc and Intertek Scientific and Regulatory Consultancy to produce this review. The Calorie Control Council has a vested interest in demonstrating Splenda to be safe. The consultant groups have a vested interest in pleasing the Calorie Control Council. Therefore, this review has a higher-than-average likelihood of bias. Is Splenda safe? It very well may be safe, but some contrary evidence exists (this paper dismisses it). It would be interesting to see how independent scientists view the matter. Should nutrition scientists take food-industry funding? As a newly appointed advisor to ASN’s Early Career Nutrition (ECN) group, I am pleased to be asked to explain why I do not think it a good idea for nutrition scientists, practitioners, and societies to be funded by food, beverage, and supplement companies (collectively, the food industry) for research that is in any way related to their products. If we do, we run the risk of appearing as if our interests are conflicted. More than that, we risk being conflicted—influenced to be less critical or silent about nutrition issues related to the donor’s products. There is no getting around it: whatever the reality of the relationship, taking money from a for-profit food company makes us appear to be supporters of whatever products the company sells. I worry a lot that financial ties between food companies and ASN tarnish its reputation and ours. It troubles me when critics outside our profession view us as “on the take” and publish reports exposing ASN’s financial ties to companies that have a marketing stake in what we study or say about their products. When ASN meetings are sponsored by food companies, it makes these financial ties seem normal. ASN provides a platform for industry-sponsored sessions such as the one this year on the benefits of Stevia, but you can bet they don’t include speakers who might say anything critical. Sponsorship excludes that possibility. Most of what we know about the effects of sponsorship comes from a very large body of research on funding by the cigarette, chemical, pharmaceutical, and medical device industries. The results of this research are remarkably consistent: they demonstrate that industry funding influences the design, interpretation, and outcome of research. Nutrition is late to this type of investigation, but several recent studies show that studies funded by the food industry almost invariably favor the interests of the sponsor. Publication bias against negative studies explains only a small part of these findings. Investigators who take such funding insist that it has no effect on the design, conduct, interpretation, or publication of their research. This insistence is consistent with another large body of research demonstrating that gifts have a profound influence on attitudes, behavior, and action–but that recipients are blind to these effects. The medical literature shows that even small gifts—pens and pads—are enough to influence prescription practices, and that larger gifts have even greater effects. But the influence occurs below the radar of critical thinking. It is unintentional, unconscious, and unrecognized. What most troubles me is the lack of questioning of industry penetration into our societies and research. I think we should be raising questions about ASN’s involvement with companies whose profits might be affected by our opinions or research results. Should ASN have competed to manage the industry-funded Smart Choices program that ended up putting a seal of approval on Froot Loops? Does it make sense for ASN to endorse public policy statements promoting the benefits of processed foods or opposing “added sugars” on food labels? Is it reasonable for ASN to argue on social media that it is inappropriate to question industry funding of research? Must ECN sessions at the annual meeting really be funded by companies such as PepsiCo (last year) or Abbott Laboratories? These actions send the message that ASN is an arm of the food industry and that we uncritically support what it makes, sells, or does. But let’s turn to a more immediate concern: research funding. As early investigators, you face intense pressures to bring in external grants to pay for your studies, overhead, and maybe even your salaries. Government funding for many areas of nutrition research is declining. These pressures are real. But just as real are the effects of industry funding on research. From March 2015 to March 2016, I posted summaries of industry-funded studies on my blog. During that year, I collected 168 studies. Of these, 156 yielded results favoring the sponsor’s interests. I only could find 12 studies that did not. This was a casually collected convenience sample but it did allow one conclusion: it is easier to find industry-funded studies with positive results than those with negative results. Nevertheless, recent systematic studies come to the same conclusion. Studies funded by Coca-Cola, for example, are far more likely to conclude that its products have no effect on obesity or type 2 diabetes than do studies funded by government or foundations. Because we are generally unconscious of the influence of financial ties, it is easy for us to deny the influence or argue that nonfinancial interests—preferences for hypotheses and desires for career advancement–are just as biasing. Yes they may be biasing, but all scientists have them. In contrast to financial ties to industry, it is not possible to eliminate nonfinancial biases and still do science. I am often asked whether there is a way to take money from food companies and maintain intellectual independence and professional reputation. I regret that I cannot think of any viable way to do that. The ASN has appointed a “Truth” commission to examine this issue and I look forward to its report. In the meantime, I am hoping that you will give thought to the potential conflict of interest and reputational loss that you risk with food industry ties. You must figure out for yourself whether you think the risks are worth taking. If you do decide to engage with industry, you will need to disclose it. Most journals now require authors to reveal who pays for their work, but even when done diligently, disclosure is not sufficient to alert readers to the extent to which industry funding influences research outcome and professional opinion. Yes, disclosure is uncomfortable, perhaps explaining why so many studies identify frequent lapses. It is likely to become more uncomfortable. In response to a petition from the Center for Science in the Public Interest (which I co-signed), the National Library of Medicine has announced that it will henceforth add funding disclosures and conflict-of-interest statements to PubMed abstracts. 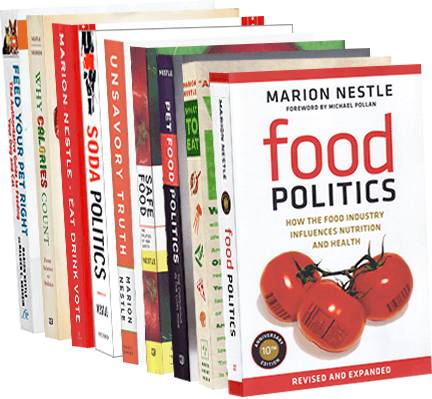 Dr. Nestle’s salary from NYU supports her research, manuscript preparation, Website, and blog at https://foodpolitics.com. She also earns royalties from books and honoraria from lectures to university and health professional groups about matters relevant to this topic.” I also on occasion speak to food industry groups. When I do, I accept reimbursements for travel expenses but ask that honoraria be donated to the NYU library’s food studies collection. This policy, imperfect as it may be, is the best I can do. I ask only that you think seriously about these issues and figure out for yourself how best to deal with them. I am happy to discuss these matters and am most easily reached at marion.nestle@nyu.edu. Nestle M. Food company sponsorship of nutrition research and professional activities: A conflict of interest? Public Health Nutrition 2001;4:1015-22. Nestle M. Corporate funding of food and nutrition research: science or marketing? JAMA Internal Medicine 2016;176(1):13-4. Krimsky S. Science in the Private Interest: Has the Lure of Profits Corrupted Medical Research. Rowman and Littlefield, 2004. Lo B, Field MJ, eds. Conflict of Interest in Medical Research, Education, and Practice. Washington, DC: National Academies Press; 2009. Simon M. Nutrition Scientists on the Take from Big Food. Eat Drink Politics and the Alliance for Natural Health, Jun 2015.